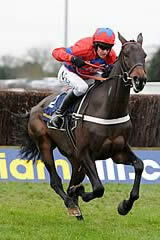 New eulogies will need to be created if Sprinter Sacre keeps winning with such authority. Today he stepped up to his biggest test in the Sportingbet Queen Mother Champion Chase and sauntered through it with ease, demolishing the best two-miler in Ireland, the former race-winner Sizing Europe, and barely breaking sweat. Trained by Nicky Henderson and owned by Caroline Mould, Sprinter Sacre carried jockey Barry Geraghty to a 19-length victory over the Irish challenger, who was six lengths clear of third-placed Wishfull Thinking. A near-breathless Henderson said: "You always hope for the best, but there are fences to jump and you can never be sure. He has such an easy way of doing it and today he was fantastic. He loves racing and he does it so easily. "We're very lucky to have him. Sometimes the crowd gets something special to watch and I hope today they have enjoyed watching him - although I don't know if I did! "He has an aura about him and he knows he's good. He doesn't hide it under a bushel - he doesn't do anything by halves. It's the way he lives. Barry enjoys it, the horse enjoys it and I hate it, but it's fun afterwards. "He's nearly the perfect racehorse. He looks it and it's rare to find one that looks so good and is so good. You would have to say that's his best performance. We were well aware that anything bar very stunning wouldn't keep people happy, but that was stunning. He was nicely relaxed, maybe a little keen early on. He didn't want to take on Sizing Europe too early, but there wasn't much Barry could do about it, and I've always said don't disappoint him if he takes you there. Don't take him back because that cruising speed is so high. "We'll keep the earplugs on him because he's getting so much attention now and he just needs to concentrate on what he's doing. "We've talked about Punchestown, but we'll see. He's only had three races this season because that's more or less what the race programme dictates to you. There's a nice Grade One at Punchestown and that's possible and then he could have a summer off and come back and defend his title." Bloodstock agent David Minton bought Sprinter Sacre as part of a €300,000 dispersal of horses in France. He said: "I had no idea there was a star among them. They were a good, level bunch, but he's easily the best. I bought Remittance Man [a Racing Post Arkle Chase and Sportingbet Queen Mother Champion Chase winner] but this horse must now be regarded as the best I have bought. We might not have seen the best of him yet. "It's great for Nicky Henderson, but he is the greatest trainer at Cheltenham and he's so right for this horse because he's so patient. It's a lovely story and great for Caroline and her husband Raymond." As far as Barry Geraghty is concerned, Sprinter Sacre, winner of the Sportingbet Queen Mother Champion Chase by 19 lengths, owns the same qualities of excellence that set top-class human sportsmen apart from the rest. "I've never ridden a horse that does it all so easily," he said of the seven-year-old. "He has such power and scope, and that gives him the time he needs. He's like a top footballer, like Pele on the ball, who used to do it all easily because his speed and power and skill gave him the time to do it. "He made a mistake at the ditch, the first he's ever made, but he knew what he was doing and it wasn't really a mistake. He was long into it, really long, and he put down on me, but off that ground he was telling me that was the thing to do. And he absolutely winged the next, and winged the last." Geraghty has been the partner of the two outstanding two-mile chasers of the modern era, Moscow Flyer being the other. "I'm not saying this lad is better than Moscow Flyer, but the ease with which he does everything sets him apart." Sprinter Sacre carries the colours of Caroline Mould, who admitted that watching her champion brings a certain amount of stress, even if pleasurable stress. "If it doesn't sound too arrogant," she said, "last year when he won the Arkle Trophy it was ok because we were pretty confident he'd win that, and he wasn't really in the public eye. But this time it's been completely different. Sleepless nights, dry mouth, beating heart, grinding teeth, the lot. Everyone says I should enjoy him and moments like today, and I am. But I'm always relieved when it's all over and I can enjoy it properly." Trainer Henry de Bromhead was in a reflective mood after 6/1 second-favourite Sizing Europe was beaten nineteen lengths into second place by the brilliant Sprinter Sacre in the Sportingbet Queen Mother Champion Chase. The 2011 Champion Chaser went toe-to-toe with the eventual winner for the majority of the race and seemed to stumble as the field crossed the road coming down the hill but his trainer conceded that the race was probably over when this mishap occurred. "We've had a go and served it up to him but have come out of it second-best," said de Bromhead. "The chippings seem quite loose on that covered road and he seemed to stumble on the crossing but the race was over at that point and it's had no effect on the result. The winner is a phenomenal horse but we're proud of our man too - we've still finished second in a Champion Chase. 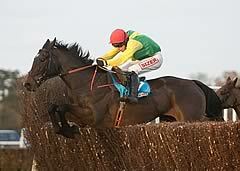 "Sizing Europe has been the horse of a lifetime for me and I've had many unforgettable moments with him. He's not getting any younger but he's won plenty this season and it's likely we'll head to the Punchestown Festival with him. We know he gets a bit further so we always have that option with him but he's still got plenty of speed for a horse his age." Third-placed Wishfull Thinking was six lengths behind Sizing Europe in third and trainer Philip Hobbs was quick to praise the winner. "He's run a perfectly respectable race but we couldn't get anywhere near Sprinter Sacre," said Hobbs. "The winner is an incredible horse and it was a pleasure watching him."